The Yaffa Black Label is custom from start to finish. Handcrafted individually for you and with continued collaboration with you by Yaffa herself to create a hairpiece that will match your style, your natural personality, and that will look and feel absolutely natural. We begin with a friendly and personal conversation about the kind of look and length we're looking to achieve. Often our clients bring us a picture of a hairstyle they want. We'll discuss just the style that fits well with your facial features and complexion and go over every detail. Our clients come from all over the world for the name and quality of the Yaffa Black Label and we create an absolute custom marvel without you having to walk into our showroom. We'll guide you every step of the way regarding the proper measurements. The net, the cut, the color, and the styling are all done by Yaffa herself with her eye for elegance, precision, and the utmost in quality. 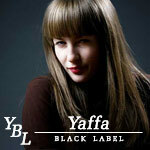 There's only one Yaffa Black Label, available here and nowhere else! Get more for your wedding! Don't forget to mention ChossonKallah.com when visiting Yaffa Black Label.